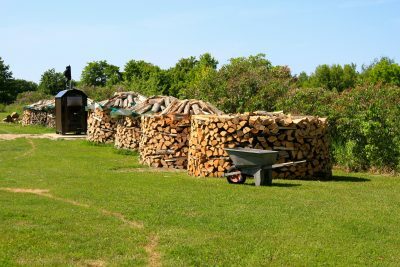 UPDATED 17Aug2018: After more than 20 years of stacking firewood in square or linear piles, I discovered that stacking in round piles is not only easier and more stable, it’s also far more attractive. I’ve been doing it now for more than five years and it’s great. In fact, next week I’ll be working with my son on our wood piles. I first noticed round piles from photos of how they stack wood in Nordic countries. The results looked cool, then I began to consider the possible advantages. It’s been years since I’ve stacked wood in square piles and I won’t go back. 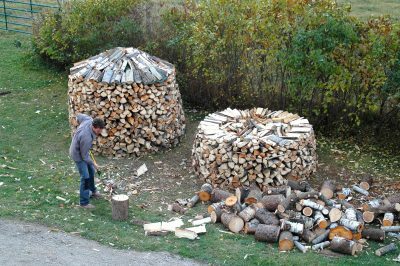 Speed, stability and good looks are the advantages of stacking firewood in round piles. Try the process yourself and see if you like it. I think you will. 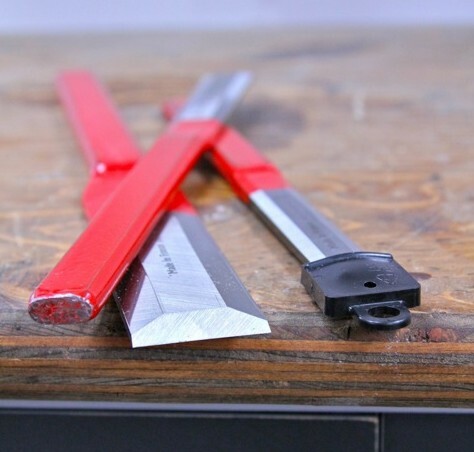 I cut wood and heat with it because I like the financial savings and I like the process, but I also have a lot of work to do on my modern homestead. Efficiency is something I don’t have the luxury to ignore. Stacking wood in round piles takes about half the time of square stacking because not all the wood has to be placed just-so individually. Only the walls of the round pile are stacked. All the wood in the middle is just thrown in. For the last few years, when my son and I split firewood together, it goes right into the bucket of our tractor off the splitter. From there we just drive over and dump it into the hollow centre of the round pile. We only “stack” about 1/3 of our firewood. The rest just tumbles into place inside the pile. This also affords us the luxury of stacking only the nicely shaped pieces on the outside. The gnarlier pieces always go into the middle. No need to wrestle with them. Click for a video on the 3 reasons my chainsaw is still running perfectly after 30 years of use. Square wood piles can be stable too, but I know from experience that it’s harder to make them stable than round piles. This is especially true is the ground if the least bit unlevel. Why the difference? First of all, round piles are much wider than most square ones. They have a bigger footprint. Also, it’s easy to make round piles so the wood is “tied together”. We lay in long poles every 3 or 4 feet up that span from one side of the pile to the other. With more wood stacked on top, the poles bind everything together. It’s easy to make a round pile that never tips over as the ground heaves with frost. When it comes to firewood, the drier the better. And for reasons I don’t understand, round piles seem to let wood dry more quickly. You wouldn’t think so, but they do. At least they do the way we make them. The trick is a tarp built under the top layer of wood on the pile. This forms a little roof that stays in place if you take the wood out from underneath here and there. The roof just kind of settles down as you use wood. I had some 13-foot diameter round tarps made from heavy, waterproof fabric for our 10-foot diameter piles, but I should have gone with 14 foot tarps. Since the top of the pile is domed, there’s not a whole lot of overhang with the 13 foot tarps. I’d like a bit more. Saving space doesn’t matter much for some people (us included), but for others it’s a big deal. Since it’s possible to stack round piles 6 feet high or higher, you can really reduce the footprint of your year’s supply of firewood if you want. By my calculation there’s about 8 face cords of wood in a 10-foot diameter round pile that’s 7 feet high at the peak. That’s a lot of wood in a little space. This is the least important of the reasons, but it does matter to some of us. I love the look of a couple of winter’s worth of wood ready to burn, and I get compliments from people driving by. “Boy, do those round wood piles ever look great!” It’s a nice thing. Click below to watch my how-to video to learn all about stacking firewood in round piles, and how to make that firewood pile shed rain water when the world gets wet.